According to the research, Asia-Pacific’s private education market is estimated to be worth US$370 billion (B12.08 trillion). The industry has seen a surge in demand from the region’s shifting macro-economic and favourable demographic trends, such as rising household wealth and rapid population growth. 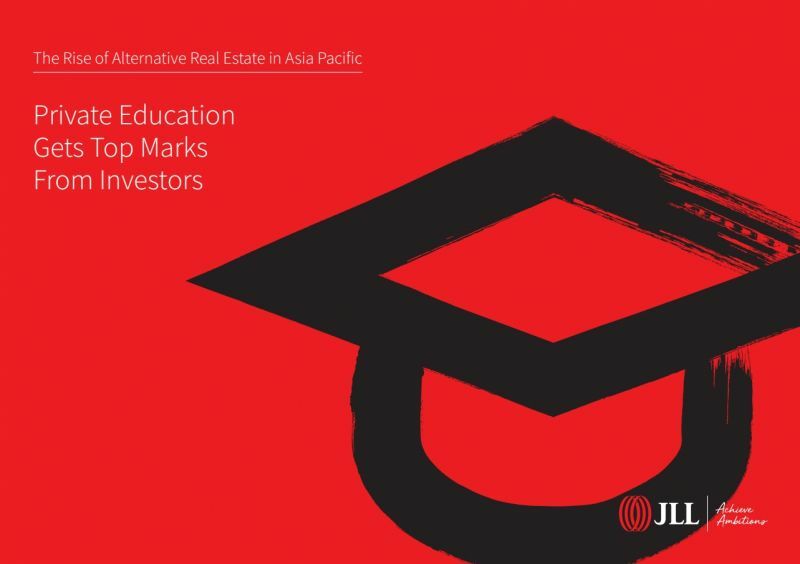 “With a burgeoning local middle class, shrinking family sizes and more double-income households, parents are now seeking first-rate academic options taught in English to give their children a leg-up in an increasingly globalised society,” says Noeleen Goh, Director of Alternatives, Capital Markets, JLL Asia-Pacific. In Hong Kong, the number of English-medium international schools increased from 92 in 2000 to 177 in 2017, and the number of students more than doubled during this period. Countries without an adequate national English curriculum such as Vietnam, Thailand, Japan and China, have also seen a spike in popularity among parents for English-language teaching institutions. “The proliferation of international schools in the region means that competition for students is fierce, so the quality of education is now higher than before. When choosing where to spend tuition fees for their children, parents place a lot of emphasis on an institution’s overall academic reputation, curriculum, teaching quality and even university acceptance,” adds Ms Goh. 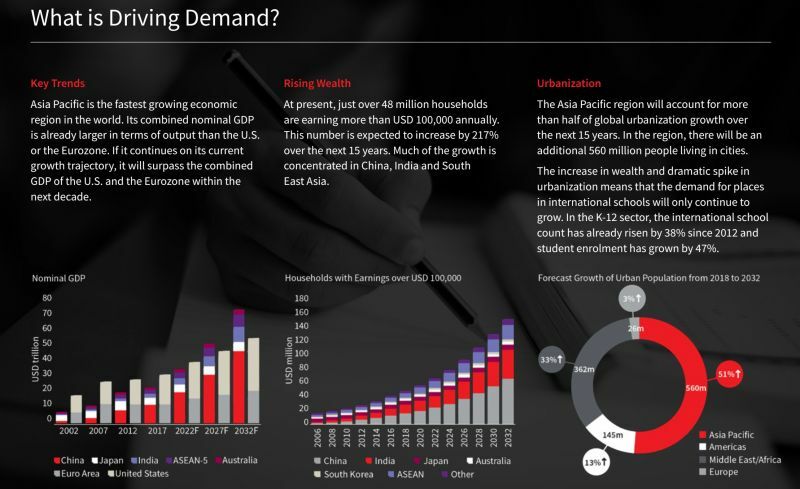 JLL also revealed that international schools in general have shifted their focus to affluent local markets in the face of declining expatriate families on company packages. Countries such as Malaysia and Thailand do not have any restrictions on international school enrolment, while Vietnam, has also relaxed restrictions in the recently issued Decree 86, allowing an intake of up to 50% of local students. Investment has been rising among companies that run international schools, which have backing from institutional investors, private equity firms and pension funds. “In the private education sector, it’s common for operators to separate the real estate from the operating company – this gives investors the option to sink their capital either into the education operations or the real estate assets,” said Ms Goh. She explains that the former can channel their funds to invest in the core business of educational services. Real estate investors, on the other hand, can maximise the asset value by leasing the school facility back to an established long-term education operator or building a bespoke campus with rents to hedge against inflation. “With yields set to be at a premium above traditional asset class, many are keen to delve into this sector as it offers high-growth and is fairly recession-resistant due to its long-dated leases, making it less prone to market volatility compared to the more traditional property assets,” explained Ms Goh. However, the report points out that market entry may pose a challenge in some countries with stringent teaching licenses, or where basic national education for locals is compulsory and foreign ownership is restricted. 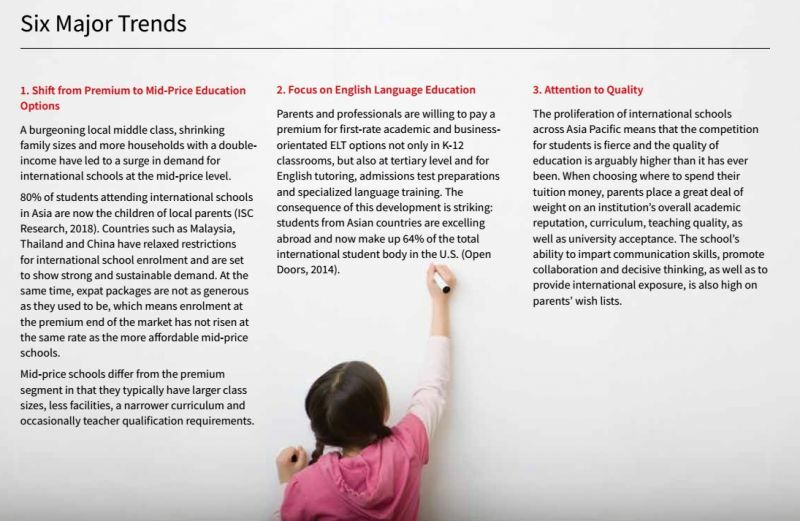 To download the full report ‘Private education gets top marks from investors’, click here. In Thailand, JLL is the largest international property services firm with 1,600 employees.